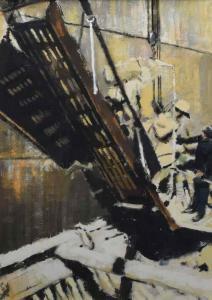 Find artworks, auction results, sale prices and pictures of Anthony Butler at auctions worldwide. Anthony Butler R.C.A. 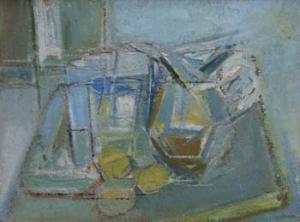 (1927-2010), "Disembarkation", signed and dated '84, gouache, 60.5 x 42.5cm, 23.75 x 16.75in. Artists' Resale Right ("droit de suite") may apply to this lot. Condition Report: The painting is in very good, original condition with no obvious faults to report. The painting is framed and glazed. Anthony Butler R.C.A. 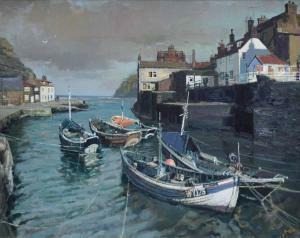 (1927-2010), "Staithes", signed, titled and dated 1988 on verso, oil on canvas, 59 x 74.5cm. ; 23.25 x 29.25in. Artists' Resale Right ("droit de suite") may apply to this lot. Condition Report: The painting is in very good, original condition with no obvious faults to report. The painting is framed but not glazed. 59.5 x 74.5cm. ; 23.5 x 29.5in. Anthony Butler R.C.A. 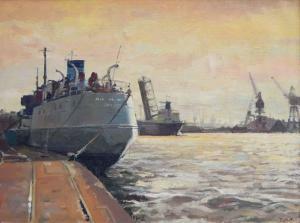 (1927-2010), "Evening Tide - Birkenhead", signed, titled on artist's label verso, oil on canvas, 44.5 x 59.5cm. ; 17.5 x 23.5in. Artists' Resale Right ("droit de suite") may apply to this lot. Condition Report: The painting is in very good, original condition with no obvious faults to report. The painting is framed but not glazed.